An aquarium, like a garden, needs weeding and the plants must be pruned now and then, or it gets overgrown. But care is necessary to maintain the balance in the aquarium, and not to create ideal conditions for algae by pruning too severely. 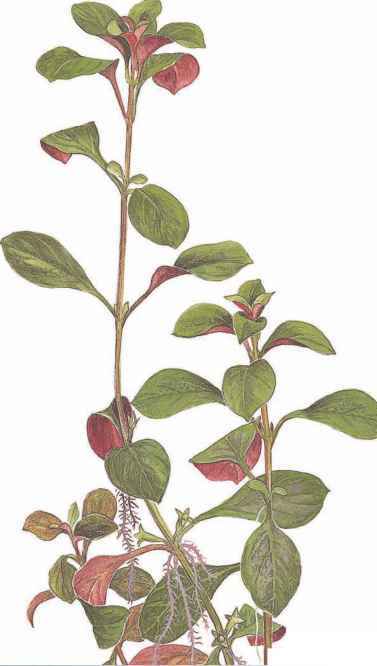 Plants with stems should always be pinched off before they reach the water surface, as they will otherwise overshadow themselves as well as other plants. The new side shoots will make the plant more compact. The top shoots can be planted on the bottom again, where they will rapidly develop roots. 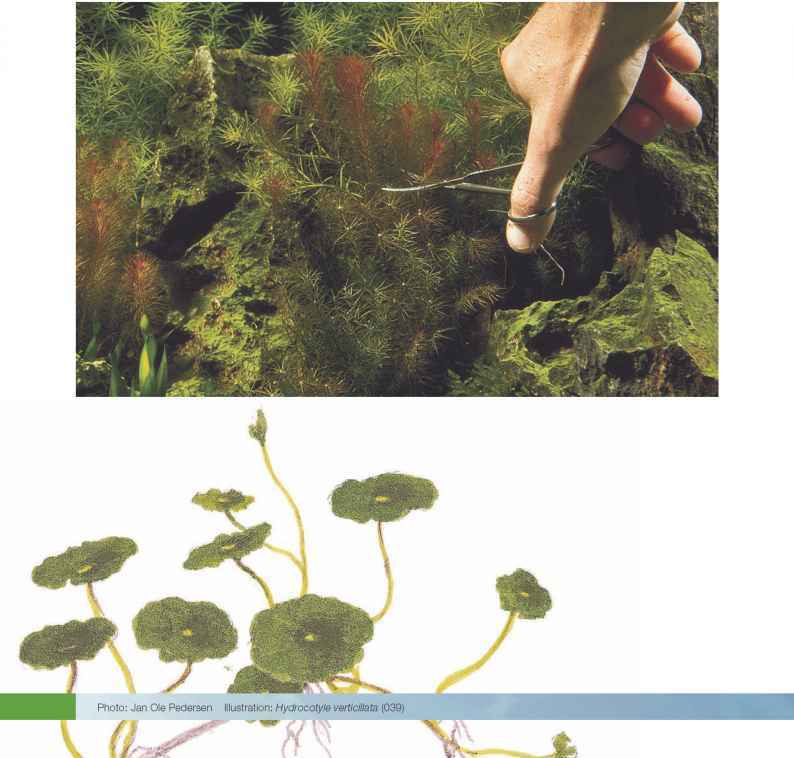 If Anubias, Bolbitis and Microsorum grow too large, part of the plant can be removed by carefully cutting part of the horizontal stem (the rhizome) away. If groups of Crypto-coryne are growing too close, suitable sized sections of them can be loosened with a sharp knife and pulled away from the bottom while holding the remaining plants in place. Thick clumps of Sagit-taria subulata, Echinodorus tenellus or Echinodorus quadricostatus can be thinned out by cutting the stems between the runners and removing individual plants. The larger Echinodorus, Aponogeton and Nymphaea can only be pruned by removing some of the leaves. 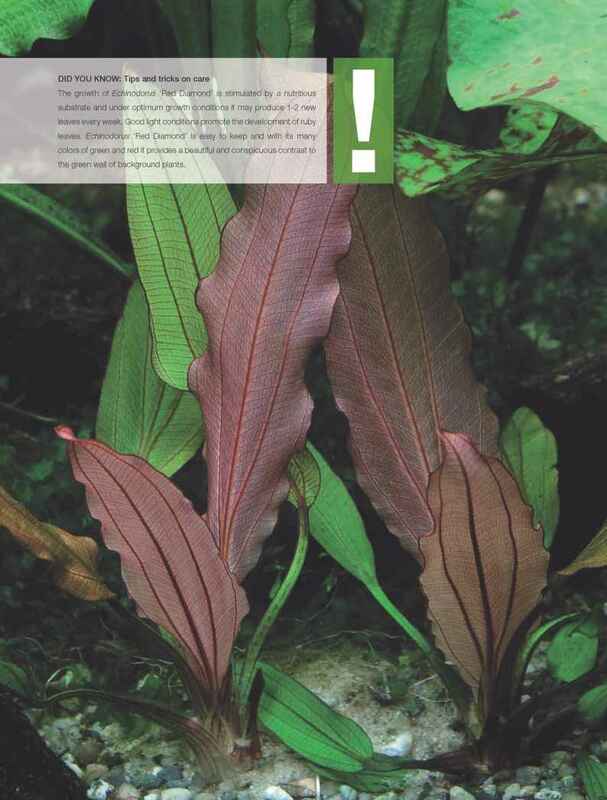 It is therefore wisest to choose plants whose maximum size is suitable for the aquarium in question. The hardness of the water and its CO2 saturation play an important part in how well plants and fish thrive. Typically the total hardness of the water is specified (as GH), which indicates the level of calcium and magnesium. It is also important for certain fish species, because calcium and magnesium are nutrients for the plants. The plant aquarium owner is far more interested in the carbonate hardness (KH), which indicates the bicarbonate content (HCO3-) of the water, because KH, the pH level and the CO2 content are closely linked. 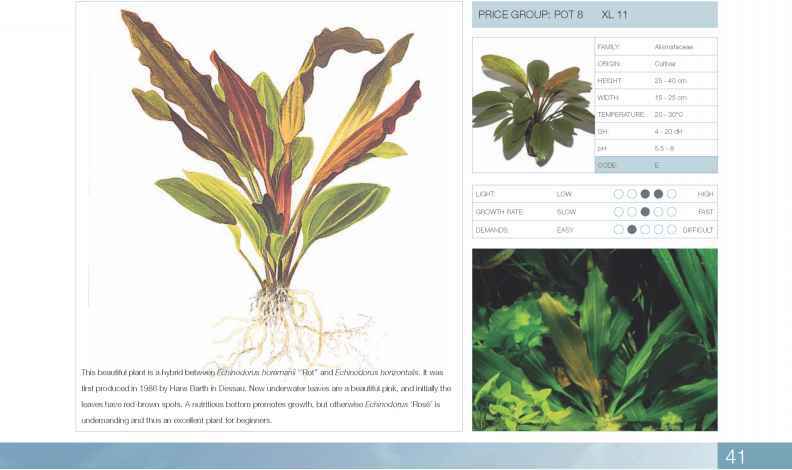 Put very simply, most plants can be grown when the KH is between 3-12, pH is 6.57.5 and the CO2 content is 10-30 mg/l. The equipment for measuring these values can be bought from any aquarium dealer. Aeration pumps and motor filters which cause strong ripples in the surface are prohibited in plant aquariums because they drive CO2 out of the water and cause the pH level to rise. If the pH level is too high, even with still water in the aquarium, CO2 must be added using the equipment mentioned earlier. If the KH is too low, a supplement can be bought from the aquarium dealer. If on the other hand it is too high, matters become slightly more complicated. It is possible to add rain water, but because of air pollution it is safest to buy a demineralising system, which will convert tap water to soft water. This solution does require more space, however, for the extra installations. Aquarium owners distinguish nitrogen (N) and phosphor (P) from all the other nutrients in the water, because most people keep far too many fish, and feed them too generously. If at the same time water is not changed often enough, they have the same nitrogen and phosphor pollution which encourages algae and causes hot debate in the marine environment debate in the media. Only a few fish, no excess feeding, and frequent water changes are the keys to avoiding excess nitrogen and phosphor. At least 25% of the water should be changed every two weeks. A siphon draws the water off and at the same time sludge and left-over food can be carefully removed. If done thoroughly, this saves "spring cleaning", which disturbs the balance in the aquarium. As a rule, there will be sufficient magnesium and calcium in tap water, except in areas with very soft water. The other nutrients (potassium, sulphur, iron, manganese, copper, zinc, boron and molybdenum) must be added in the form of aquatic plant fertilizer such as Tropica AquaCare. 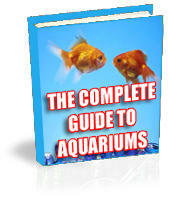 Remember that every new aquarium needs a period of one or two weeks to settle down. During this time there should be no fish in the aquarium, except for types that eat algae, which can be introduced after the first week. We give Tropica aquarium plants everything they need to grow large, healthy and beautiful. But even the most robust plants make some demands on their surroundings if they are to grow optimally. Tropica AquaCare is a range of aquarium fertiliser products developed on the basis of more than 35 years of experience of tropical aquatic plants, and it has been thoroughly tested in a range of different aquarium environments. Tropica AquaCare takes full account of the needs of fish and plants, ensuring a healthy balance in aquarium water which resembles the natural balance itself. All the same, plant food should only be given where necessary. As a rule of thumb, if the new leaves on the plants are dark in colour, then they do not need much fertiliser, while if they are pale, it is a good idea to give them a little more. It is also necessary to take into account that in soft water the plants only need half as much fertilizer as in hard water.